Lids, that place for all things you put on your noggin, is having their biggest sale yet this weekend. Get a hat and more for as little as $5! I thought this store was hat-exclusive but I was wrong. 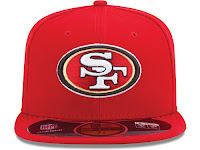 They're a retailer of sports headwear, apparel, accessories, and novelties. That means hats (of course) but jerseys, bobbleheads, bumper stickers, etc. Pick your favorite team and see what's discounted. I'm decking myself out in Giants gear from head to toe. Click here to view the sale at Lids.